If the shoe fits, wear it. Or better yet, make your own. 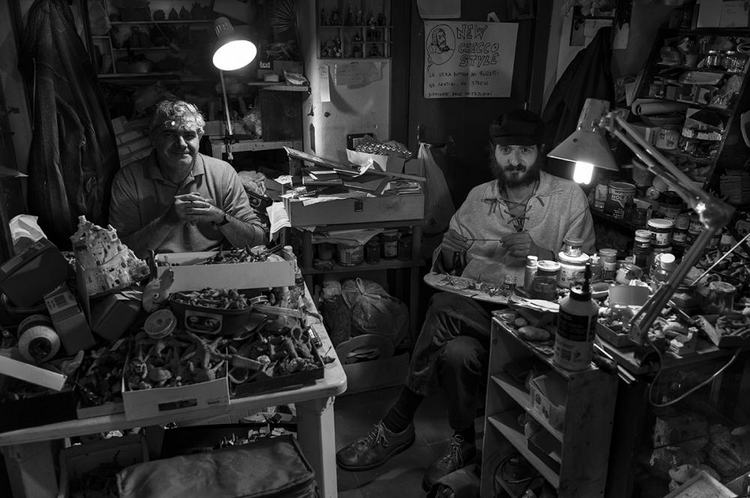 A year and a half ago, I found myself talking to a guy on the beach during the 4th of July who pointed to his shoes and said “I made these.” All I could say was “whoa” and “where.” I couldn’t remember what this guy’s name was if you paid me, but you can bet I never forgot there was a shoemaking school nearby. There are possibly as many trades fading into obscurity as there are languages, and bringing attention to them and demystifying them even just a little is a big part of what gets this girl out of bed in the morning. Come back!!! Shoes! Custom-fit and handmade in the workshop. 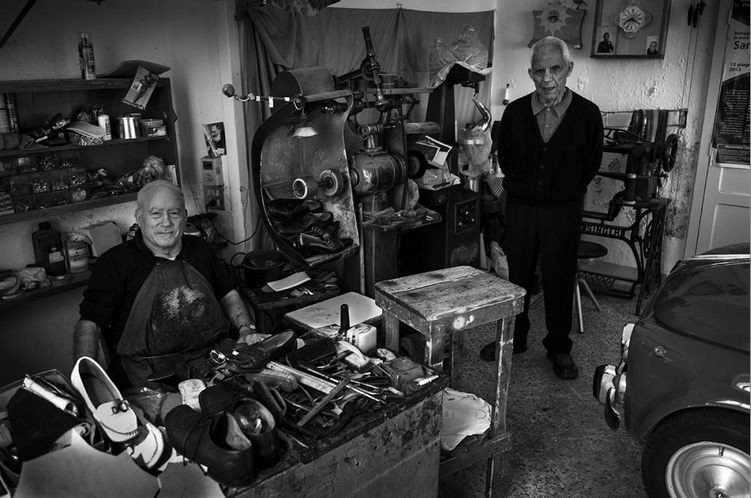 Enter: Sara McIntosh, a cobbler for 39 years, and the wonderful human who started the Chicago School of Shoemaking in 2011. 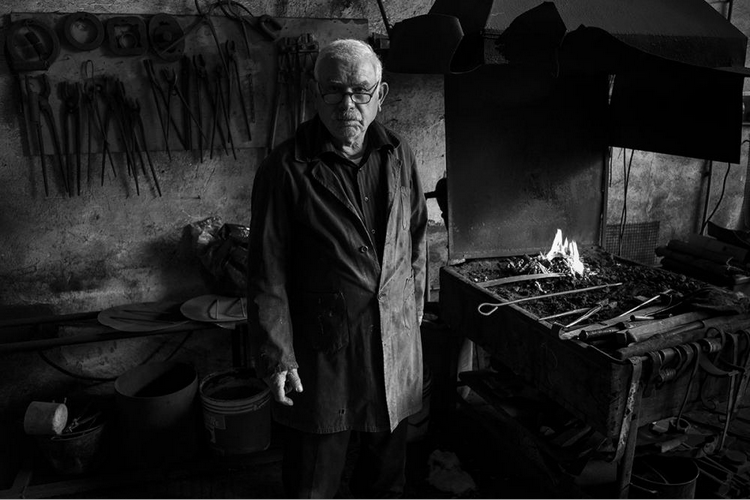 After turning 60, she decided that she wanted to go beyond creating custom made shoes through her shoe shop, and that it was time to empower others by teaching them the trade. Sara is a self-taught cobbler who embraced the self-sufficiency lifestyle in the 1970s, which focused on sustainable living in the truest sense–by living with only what she could produce and not consuming outside goods. So basically, she needed a pair of shoes so she made herself a pair of shoes. I know, I want to be her, too. Sara McIntosh, founder of the Chicago School of Shoemaking and Master Cobbler. She even made the mallet! See? 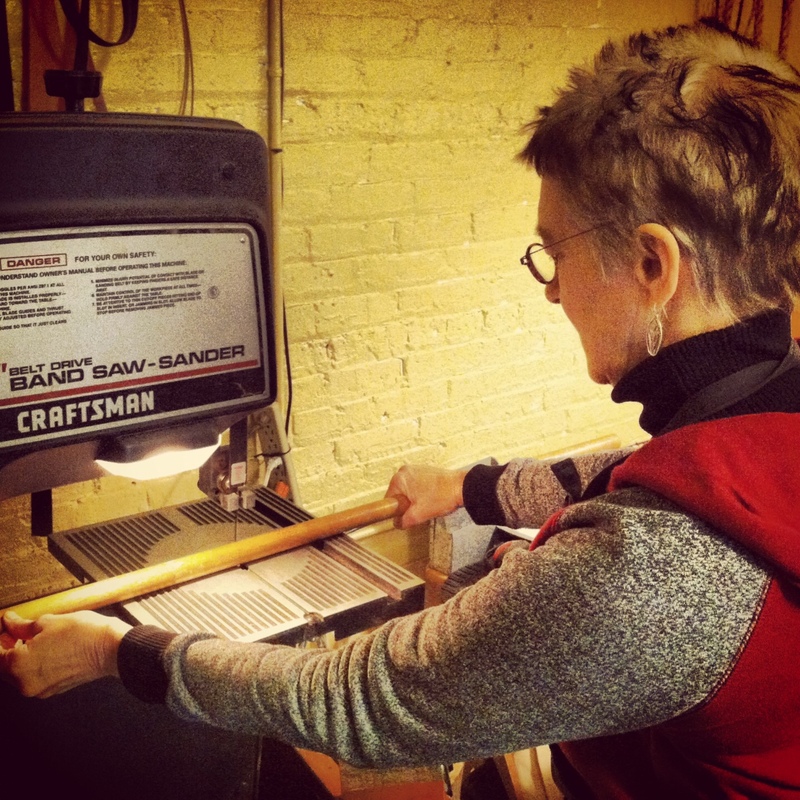 Sara’s Craftsman bandsaw is used to cut down a dowel that become the handle for a mallet and then rough cuts the mallet head as well. 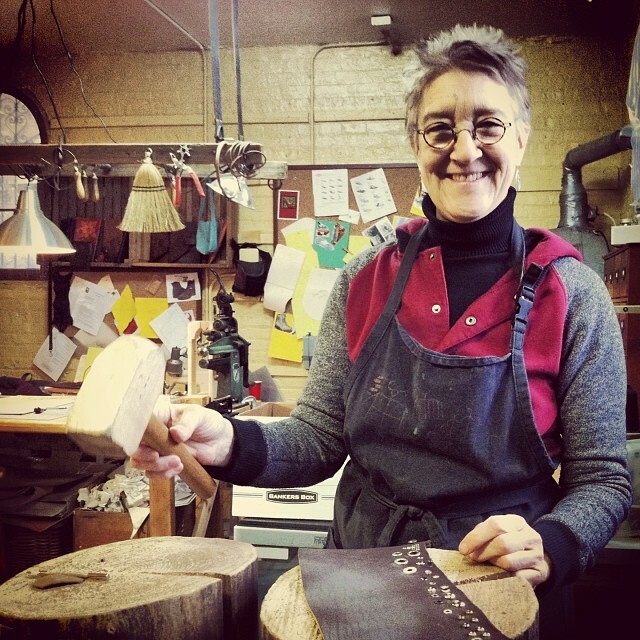 She also uses the bandsaw to shape the souls of the shoes. Beyond the empowerment that comes from knowing that you can just make whatever you need (she has also built her own log homes, grown her own food, etc.) the freedom that comes with such a useful skillset has allowed Sara to live all over the U.S. and support herself and family wherever she has gone. Everyone needs shoes, and she is one of only a few people left in the country who custom makes them by hand from scratch. 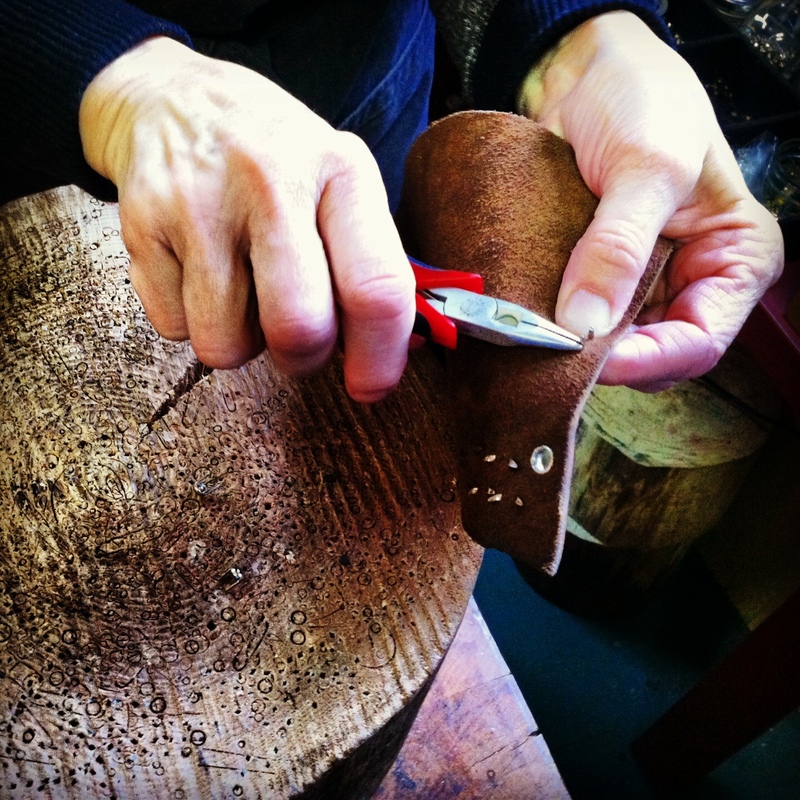 There are a couple of different methods of fabricating shoes, and Sara developed her own based on the out-stitch technique, which lends itself to people who make shoes out of their home or in a small shop. 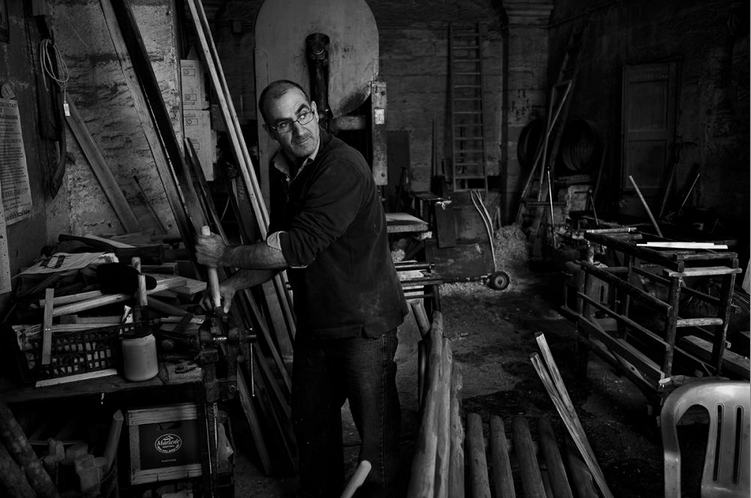 There is a band saw in the back of the shop that is used for a variety of things, including rough trimming the souls of shoes and cutting down dowels that are made into mallet handles. Awls are used for marking lines in leather, metal squares help with patterns, pliers replace rivets and add studs, nippers can cut a chain or destroy a bad rivet…most tools are hand tools and it didn’t seem difficult to set up one’s own workshop once you knew what you were doing. Sara uses a square as an edge to pattern the leather. 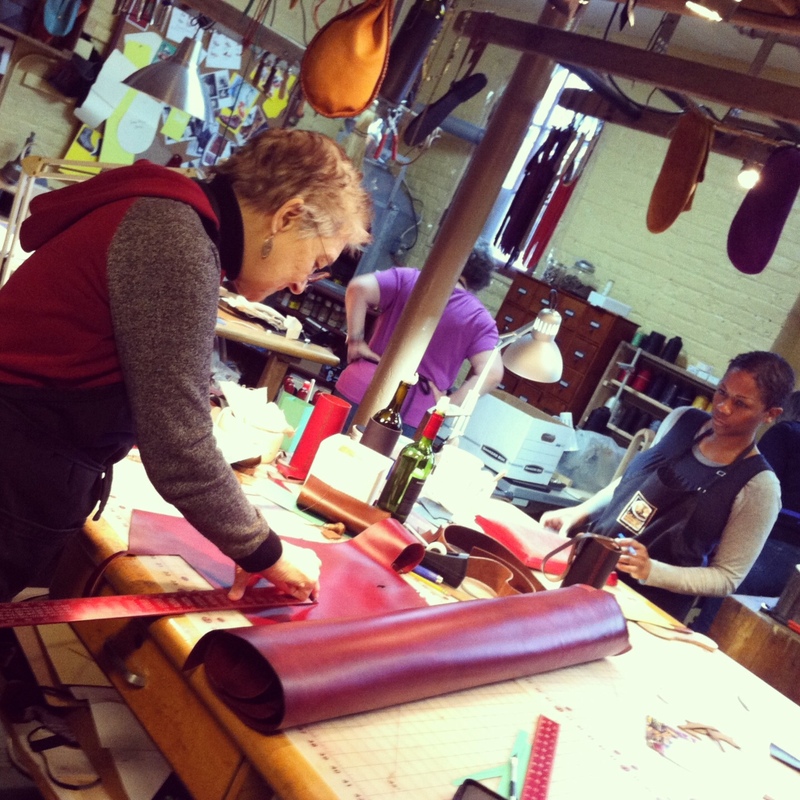 Keisha looks for guidance as she works on a leather tote. 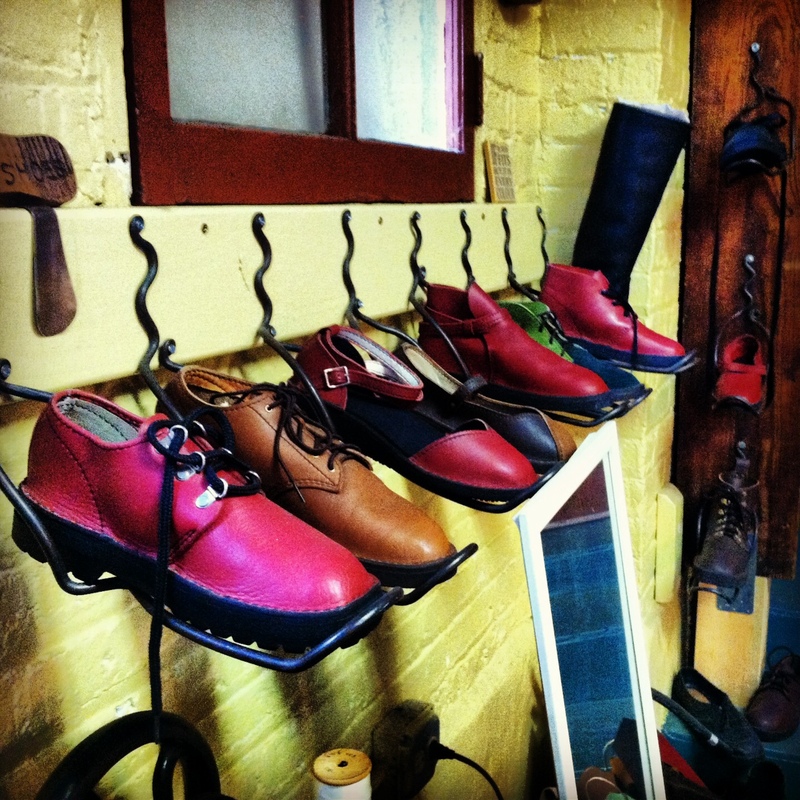 There are a variety of leatherwork and shoemaking classes at the school for both beginner and advanced students, and over 500 people have come from around the country to learn. 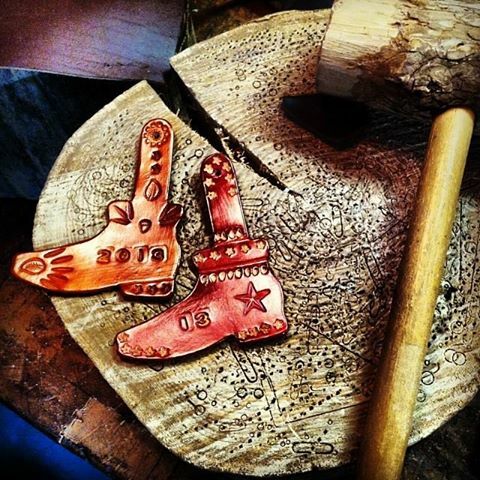 I visited the workshop on a leatherworking day and made some ornaments by stamping, dying, and burnishing leather pieces. I can say with great sincerity that burnishing is now one of my favorite things in the world to do–I’d be arthritic within a year as my compulsive nature shined up every piece of leather on this here earth. 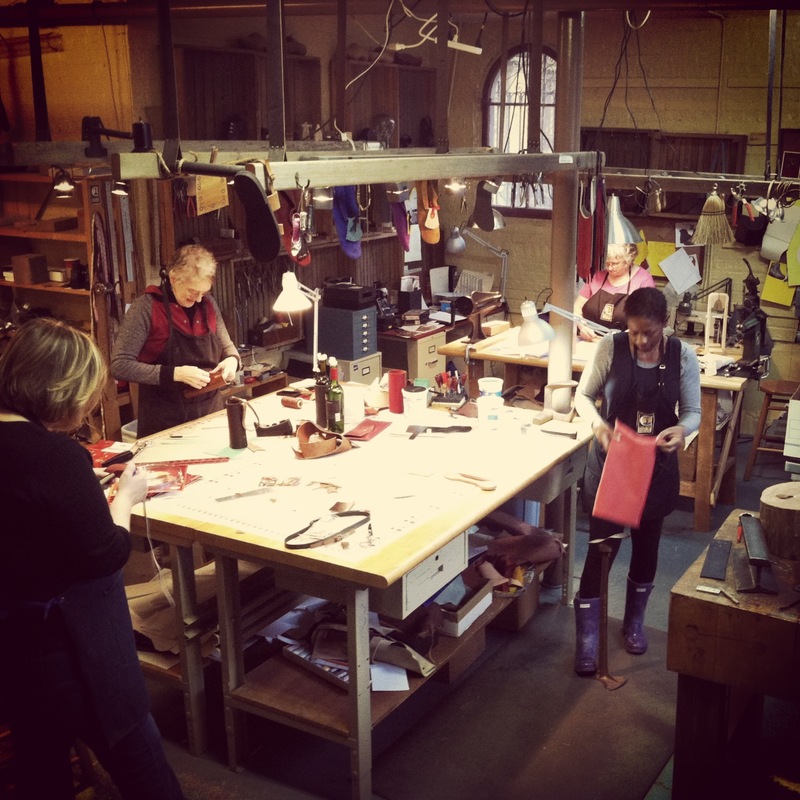 Others in the workshop that day were making leather bags, a belt, a Kindle case (that would bring you to your knees, seriously), and a wallet, and folks also often make leashes, wine holders, purses, and anything else they can think of. Pliers are used to replace rivets or add studs to leather. Alas, ordering shoes from Sara will land you on a long waiting list, but embracing a sustainable/self-sufficient lifestyle will land you in some classes and enable you to teach yourself and never be wanting or lacking a creative outlet. Basically, it’s contagious and once you know you can make one beautiful, custom thing you have the confidence to make more. Check out the Chicago School of Shoemaking philosophy and classes here and glide around town in the best fitting custom kicks you’ll ever own. My very, very, very well burnished ornaments. Happy holidays! Go build something.